Right, there’s a lot of Khorne to look at this week so let’s get stuck in shall we? First of all we have this chap, the third new model I’ve added to Sapir Redwolf’s Skullrippers, a little squad of Khornate terminators I’ve been showing off over the last few weeks. The oath scroll proved to be a bit of an issue. I may be going out on a limb here but I don’t see the warriors of Khorne taking too much time writing out oaths of moment, so at first my inclination was to cut it off. However I quickly realised that it was going to be pretty tricky to do so without needing to do quite a lot of carefully shaving down and rebuilding of that part of the leg. In the end I left it but set myself the challenge of painting a tiny symbol of Khorne onto it. Perhaps the mark has been ascribed by a Dark Apostle or a particularly bold cultist as a ward or sign of good luck upon a chosen champion? Other than that painting him was fairly straightforward and flicking him with ‘blood for the blood god’ paint from an old toothbrush was great fun as always! Working on the Skullrippers also put me in mind of Kharl the Blunt. Back in the long distant past (1988 I believe, when I was 4 and as yet uncorrupted by the nefarious touch of Chaos) Kharl appeared in the book Slaves to Darkness where he was described as ‘a Troll of some renown and little brain, who often stands perplexed, unable to choose between beating his opponents senseless with a gnarled club or roasting them with his fiery breath’. Kharl fought alongside a mob of Chaos loving humans and dwarves as a member of a warband named the Skullrippers, a name I shameless ripped off when I came to naming my own Khornate terminators. Sadly there’s no room for a troll in the far-future (in spite of their durability they don’t seem to have survived into the 41st Millennium – something I must get around to fixing someday with a few conversions) but it did get me thinking about making an Ogren Berserker. Probably nothing would have happened but I was spurred on (or led astray?) by Alex from the Dauntless 215th Praetorians who said something like ‘go for it’. (As an aside his steampunk twist on the 41st millennium is well worth checking out – his tripod in particular remains a favourite of mine). Anyway, with that my last shreds of self-control evaporated and I put together this hulking, angry gentleman. I have to say, making him was excellent fun, the Ogrens kit is amazing for building Ogren Berserkers and I’m already thinking of ways I could build some more. Just a minor update to show the latest progress on my Dark Apostle of Khorne (currently minus his backpack – removed to make painting/modelling easier). After trying him out with various tabards I plumped for this one. Although not my first, or even my second, choice it looked best in practice and adds a nicely feral element to him so I’m happy. 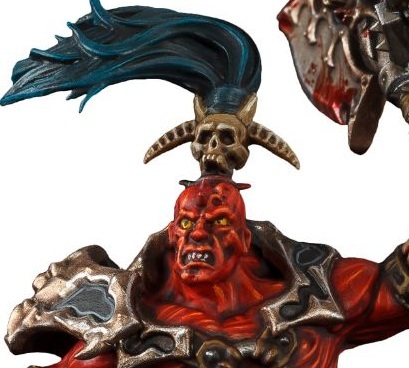 Lastly we have Skarr Bloodwrath, a man who’s name – conveniently – is also his job – the latest Warhammer character to be released as part of the End Time’s series. In many ways Skarr is for the Skullreapers/Wrathmongers released last week what Gutrot Spume is for the Putrid Blightkings – a single figure character based on an accompanying set of infantry. In both cases however I’m left wondering if it might not have been better to make them an upgrade within the existing kit as, for example, Nork Deddog is in the Ogren kit. To be honest though, although I quite like Gutrot Spume at first glance Skarr did less for me; the anime style giant weapons are not to my taste, the flying chains are rather over the top and the bare head looks like a cartoon overwhelmed by the potency of some jalapenos. At first then I was planning to let this one pass me by, at least until I’d seen the conversions that the clever people of the internet came up with. However a look at the sprue started to change my mind. I’m still not sold on the model overall but I reckon there’s a wealth of conversion opportunities in there, so much so that I might even buy one (in spite of the hefty price tag). This entry was posted on Sunday, March 15th, 2015 at 8:52 pm	and tagged with 40k, Chaos, Chaos Ogren, Chaos Space Marine, Chaos Space Marines, Conversions, Converting, End Times, Games Workshop, Hobby, Karl the Blunt, Khorne, Miniatures, Ogren Berzerker, Skarr Bloodwrath, Skullreapers, Slaves to Darkness, Wargaming, Warhammer 40 000, Warhammer 40000, Warhammer 40k, Wrathmongers and posted in 40k, Chaos, Chaos Space Marines, Khorne, Traitor Guard. You can follow any responses to this entry through the RSS 2.0 feed. I’m starting to think these aren’t the good guys. Liking the brutality of this chap! 😀 No, definitely not (but then, in 40k, who is?) Glad you like him, my Skull/Mongers are in the post so there should be some more angry men of Khorne in the pipeline! I have it on good authority that there was this one planet on the Eastern Fringe, it had a race of Xenos that believed in peace and goodwill towards all beings. The Tyranids ate them. True story. Be cool to see some more RAGEinators! Cheers 🙂 and keep up the good work! Brilliant! I like his stance. It makes me realise that I should be changing the stance of my models. With marine legs I just use the standard spread eagle stance haha. Great job. Cheers! Yeah, the standardisation of the legs on the basic marines (both Imperial and Chaos) is a real problem. Changing them is a bit of a faff but it’s well worth it in my opinion. On my next SM conversion I’ll give it a go.